Math Facts Fluency Blog: What if they knew their facts? What if they knew their facts? 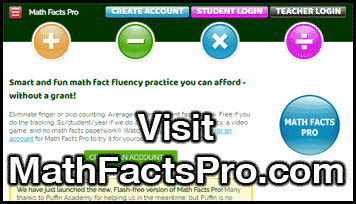 It’s our pleasure to announce the launch of Math Facts Pro 2.0! Flash and Puffin are no longer needed, and our program can be accessed directly in your favorite browser, no app required, even on iPads, other tablets, or phones. The entire code has been rewritten, including a lot of new features requested by teachers, like keyboard entry, teacher access to individual student reports, complete practice history, and of course our game, Mars Defense. Accounts that expired a while ago have been reactivated for 10 days. Try it for free!